In the modern world, it is incredibly easy to become wrapped up in our own lives and the day-to-day lifestyle and routine that we are accustomed to. This can lead to us inadvertently overlooking very important aspects of our faith: our history and heritage, our roots and where we come from. The Islamic faith has an incredibly rich history, spanning thousands of years and reaching out to every corner of the world; it has allowed our brothers and sisters a deeper understanding of our heritage and how it has influenced our culture today. Important traditions and key opportunities such as Ramadan 2019 - and the other significant festivals we celebrate every year - are essential to recognise the impact that our past has on our today. It is this knowledge that enables us to celebrate everything that is great about our faith. Make the most of the rewards this Ramadan and help someone in need. Join us here at Al Mustafa Welfare Trust as we begin the countdown to Ramadan 2019. For more information on how to donate, give our friendly team of volunteers a call on 020 8569 6444 today. 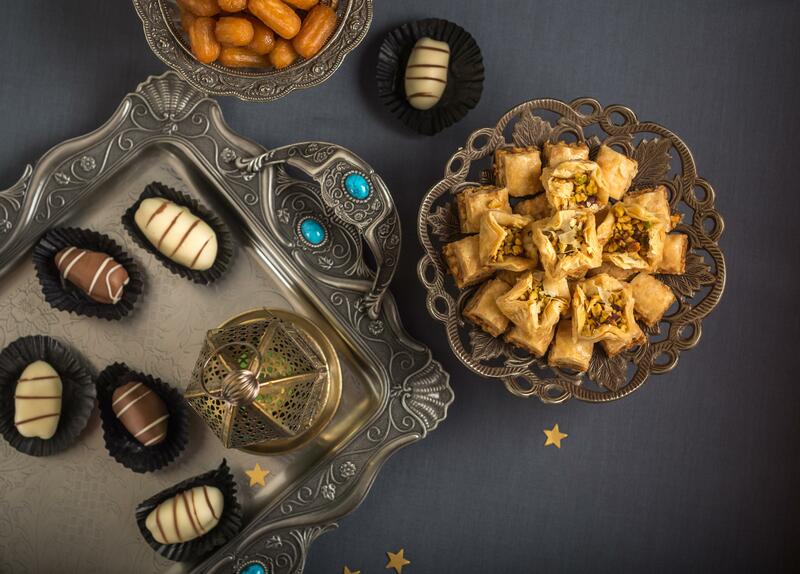 Ramadan is an auspicious month of celebration, filled with blessings and rewards for all. Not only is it one of the most important events of the Islamic calendar, but it is also one that helps out so many around the world, thanks to the generous zakat donations that are made. Ramadan falls during the ninth month of the Islamic calendar, following the lunar calendar which means that dates are subject to change by about 10-11 days each year. The 30-day period of Ramadan is celebrated by fasting – abstaining from food, drink, impure thoughts and committing sinful acts between the hours of sunrise and sunset. The time spent fasting allows Muslims to reflect on purifying their mind, body and soul which is also a means of connecting with Allah SWT through prayer. The 30 days of fasting give each and every Muslim an understanding of what it must be like to be less fortunate, in a world without possessions, food and the means to take part in such an important event. Individuals are encouraged to donate their Zakat before the final Eid-ul-Fitr prayers, the closing celebration of Ramadan. The Islamic calendar is based on the lunar cycle, which means that months rotate by roughly 10-11 days each year. Ramadan 2018 started on Wednesday 16th May and concluded on Thursday 14th June. Using the lunar cycle, here in the UK, Ramadan 2019 is predicted to fall on Sunday 5th May and conclude on Tuesday 4th June, based on the official sighting of the moon. Using this estimation, Eid-ul-Fitr will begin at sunset on Tuesday 4th June. There are Five Pillars of Islam: Shahadah, Salah, Zakat, Sawm, and Hajj. These are all integral traditions and rites of passage for Muslims and are a significant part of Islamic heritage. Shahadah (faith) and Salah (prayer) are two of the most important aspects of being a Muslim and must be carried out in compliance with the wishes of Allah (SWT) and the wise words of Prophet Muhammad (PBUH). Zakat (charity) is the third pillar and is a big part of Islamic culture. It is important to remember that zakat is about sharing our successes with those who are much less fortunate than us, thus creating a more equal balance of wealth in society. Zakat al Fitr (Fitrana) is a special zakat payment made prior to Eid-ul-Fitr prayers, allowing those less fortunate to celebrate Eid as intended. Sawm (fasting) is a very important part of Islam, especially during Ramadan. Charity given during this month is rewarded manifold. Hajj (pilgrimage to Mecca) is the final pillar and is another very important tradition that has been maintained for generations. Every Muslim that is able to physically and financially is expected to make the pilgrimage to Mecca at least once in their lifetime. As one of the Five Pillars of Islam, all Muslims are obliged to pay Zakat, if they are eligible to do so. All donations made are rewarded as giving to charity is considered a good deed in Islam. Zakat donations during Ramadan are made graciously, however, and they are rewarded many times over because the month is such a blessed one. The amount of Zakat that you need to pay is determined by your earnings, assets and retained wealth during the current lunar year. There is an obligation to pay zakat once your wealth reaches or exceeds a certain threshold. Use our calculator to determine your wealth against the current Nisab value – if you are eligible, then 2.5% of the amount above the Nisab is liable for zakat. It is important to bear in mind that Zakat is not just payable on gold, silver and cash assets; it is also payable on business profits, investments, any money owed to you, shares, property income, and bonds held. The zakat payable is based on the relevant sums at the time of payment (at the end of the complete lunar year) because maintained profit can vary over the course of the year. Paying zakat is a reminder that everything we have been given in this life by Allah SWT is worldly and we cannot take it with us when we move on. These material items are not our own, and it is our duty to share the wealth amongst His creation. Please donate your zakat for Ramadan 2019 with Al Mustafa Welfare Trust. Please ensure you give Ramadan charity and donate zakat with Al Mustafa Welfare Trust this year. The expected date for Ramadan 2019 is Sunday 5th May, concluding on Tuesday 4th June, although this is subject to official sighting of the moon. Our Ramadan 2019 UK calendar gives official dates and times for Ramadan. This timetable is sourced from the East London Mosque; please consult with your local Mosque or Imam for definitive dates nearer the time. Fasting during Ramadan is a compulsory practice for Muslims during daylight hours. By abstaining from food, water and impure thoughts, it is believed that the soul will be cleansed, and a deeper connection will be felt with both Allah and the poor and needy. Those who fast should still eat at least two meals a day - Suhoor to begin the fast at dawn and Iftar to break the fast at sunset. Meals should be similar to those you normally eat, however it is important to include food groups that will sustain you throughout the day. Complex carbohydrates such as wheat, oats and rice, fruit, vegetables, sources of protein such as milk, dairy, meat and fish and starchy foods like potatoes and bread are all excellent choices to keep you sustained throughout the day. It is advised to avoid processed and fatty food, as these can make you feel sluggish and tired. 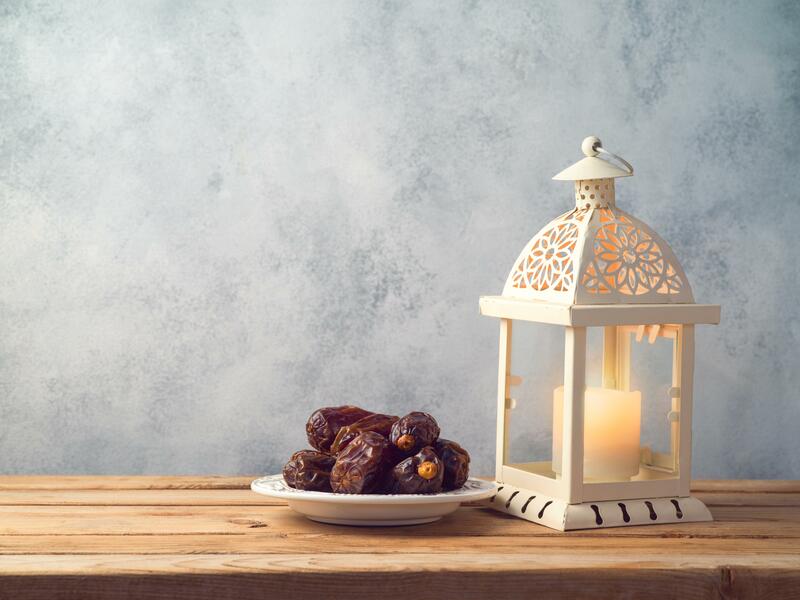 It is traditional for the fast to be broken with a glass of water and a handful of dates – this is to ensure a quick release of energy until your Iftar meal is consumed. Are there people who shouldn’t fast? What happens if you cannot fast? If for whatever reason, you cannot fast during Ramadan, then there are ways to make up for this. Fidyah – If you are ill during Ramadan and are unable to fast, then you need to donate to pay for someone else to be fed. The rate is currently £5 per missed day, which should cover the cost of two meals. If all days in Ramadan are missed, then £150 donation during Ramadan would need to be paid. Kaffarah – If you deliberately miss or break your fast during Ramadan without a medical or just reason to do so, then there are two options available. You can either fast for 60 days, or feed 60 people at a rate of £5 per person. To close Ramadan and a month of fasting, Muslims will come together to celebrate Eid-ul-Fitr. This is a time for happiness and celebration after the blessed and auspicious month. Quality time is spent with family and gifts are given, as well as Zakat-ul-Fitr donations made for those in need at this privileged time. There are many Eid traditions, such as waking up early and wearing your finest clothes. Zakat-ul-Fitr is given prior to Eid prayers at the local Mosque, after which Muslims wish each other ‘Eid Mubarak’. The rest of the day is then spent praying, eating, sharing gifts with loved ones and giving to those who are in need. Laylatul Qadr, or the Night of Power, is held during the last ten days of Ramadan. These days are significant as this was the time when the Holy Qur’an was sent to Prophet Muhammad (PBUH) by Allah (SWT) as guidance for all Muslims. The Night of Power is believed to be worth a thousand months, with rewards given copiously. Donate your zakat with Al Mustafa Welfare Trust for Ramadan 2019 and help us make a fundamental difference to the lives of those in need. From the team at Al Mustafa Welfare Trust, we wish you all a beautiful month filled with infinite reward and blessing. Ameen.